Rustic Grilled Veggie Platter with Yellow Squash, Asparagus, Green, Red and Yellow Bell Pepper. Chef Mick Brown of BBQ RESCUES! 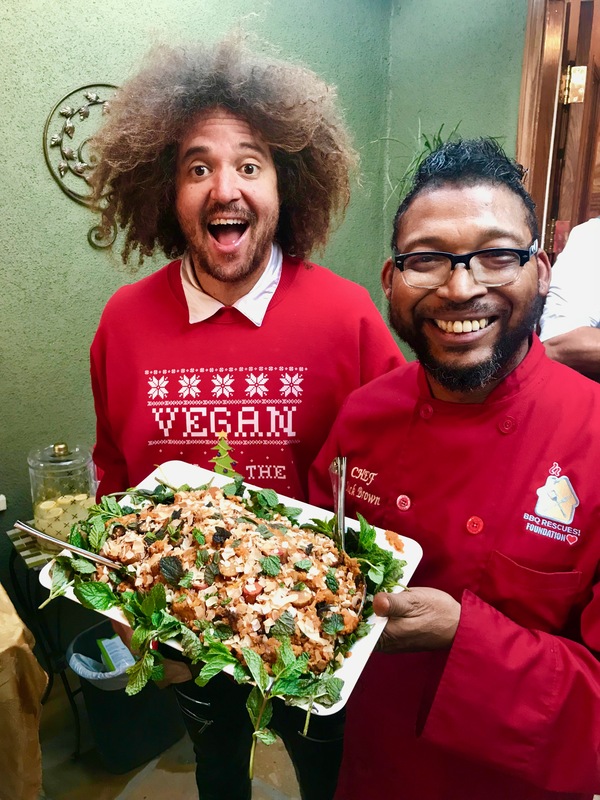 Foundation making Vegan Thanksgiving Dinner for Musician Redfoo of LMFAO Fame. Hope to see you in Fort Worth, TX. this week for the NBBQA “I AM BBQ 2018” Conference. Since 1991, The National Barbecue and Grilling Association (NBBQA) has led the way in sharing and expanding the diverse culture of Barbecue through networking and education. I plan to participate in a Session “Making Barbecue Healthy and Authentic” on Thursday. March 14, 2017 (10:30am) at this year’s Conference to be held at The River Ranch Stockyards. We will provide Samples of Authentic Vegan BBQ, and more. The first Grill I saw in Greece was a Weber attached to Catamaran on BBQ Cruise out of Athens. The word “Authentic” can mean different things to different people. For most of us in America “Authentic BBQ” is the kind we grew up with- whether it’s from South Carolina, Tennessee, St. Louis or Texas. To me, the term can also be applied to the Grilled Foods that were prepared in Ancient Greece. Back then, they didn’t have access to Cuisinarts, Refrigeration or even Pellet Grills. Most households had a simple Fire Pit for cooking everything. Grilled Veggie Platter served on BBQ Cruise outside of Athens, Greece. On a recent trip to Greece, I encountered Grilled Vegetables on the Menus of (literally) every restaurant I went to. In Ancient Greece, they grew lush gardens and groves of trees. The Olive ones became especially popular when it was discovered that they made awesome cooking oils, marinades and sauces. Sorry to break the news to Pitt Masters everywhere, but Olive Oil with Spices and Fresh Herbs was the Original BBQ Sauce. The second Grill I saw in Greece was at the Sea Satin Market Restaurant on the Island of Mykonos. Of course, Greek Cuisine kicked off what is known today as the “Mediterranean Diet”, which also includes Fresh Fish. I had the chance to visit an authentic Greek Fish Market where a fair amount of the available goods were still snapping or squirming around. I also took a BBQ Cruise on a Catamaran (with a Weber Grill attached). The Menu included lots of Salads, Grilled Veggies and fresh Seafood. Where were the Ribs? Grilled Veggie Plate at Sea Satin Market in Mykonos, Greece. The word “Healthy” when it comes to Food is a tricky thing. This is because the most “Healthy” thing people can do is to include Exercise to their weekly regimens. When it comes to Cooking, “Healthier” is synonymous with “Nutritious”. In other words, certain foods provide you with helpful Vitamins, Minerals, Proteins and Antioxidants known to be good for the human body. Some of these are known as Superfoods or High Vibrational Foods. Other foods that are considered not as “Healthy” contain excess Fats, Sugars and Sodium, with little or no Nutritional value. Note how this Greek Restaurant adds more Veggie Kebabs than Meat on a Mixed Platter. It’s amazing how us in the BBQ Community (including me) can take perfectly Healthy Vegetables and add Butter, Cheese, Sour Cream, Bacon and Meat Fats to make them taste better. We are also not shy about throwing in plenty of Salt, White (and Brown) Sugar, Molasses, etc… to everything. High Vibrational Eating is about going back to nature and eating Fruits and Veggies fresh off-the-vine, whenever possible. Also using the most nutritious fresh herbs and spices for seasoning, with Low or No Salt and Sugar. Let’s call High Vibrational ingredients the “Super-Duper Superfoods”. Another Greek Restaurant Platter shows twice more Veggies than Meat. How Can the BBQ Community Benefit? Good Question! For those attending Conference, the main presenter in my Session is Abraham Kamarak of True Made Foods. He will be delivering a very convincing mix of Facts and Statistics to show that Nutrition is the “New Black” when it comes to the Multi-Billion Dollar Food Industry. BBQ Product manufacturers should take heed and try to develop more All Natural, Low Fat/Sugar/Sodium products to add to Brand Product Lines. 1. While choosing your Ingredients for Healthier Recipes, try to include as many Fresh Herbs and Vegetables as possible. You can never go wrong with Fresh Veggies- the Fresher, the Better! Also consider controlling Portions when putting together BBQ Plates (See Diabetic BBQ Article). 2. For Sauces and Condiments, be sure to read the Labels or check for Nutritional Info Online. Avoid Products with High Levels of Fat, Salt and Sugars. Remember just because a product is Organic or Gluten Free, doesn’t mean it is healthy. Checking the number of Calories per Serving is also a good thing. Even if you don’t understand what Calories actually are, the Lower the Calories, the more likely that the product is consistent with Nutritious eating. 3. Be Creative! Most of my Recipes start with a smoky, well seasoned Vegan/Vegetarian base or broth. So everyone can enjoy them. I try to make it taste good without the meat. Adding nicely Smoked or Barbecued Meats afterwards (or on the side) kicks it up a level for Carnivores. 4. 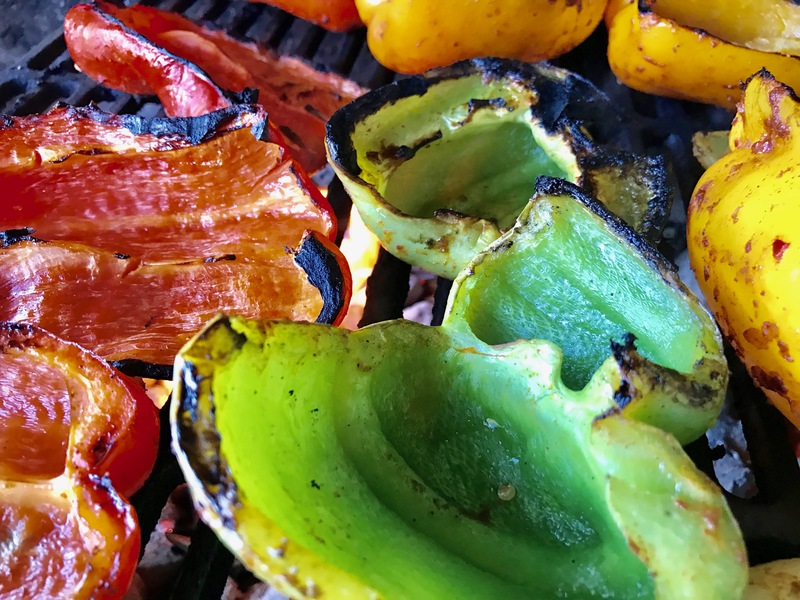 #BBQProject2020– Let the World know that you have decided to add Fresh Grilled (or Smoked) Vegetables to your Menu by using hashtag on all Social Media platforms. #BBQProject2020 is a new Initiative the recommends All Restaurants/Caterers that serve Barbecue add Fresh Veggies by the year 2020. We can do it! YES. There is such a thing as Vegan BBQ! The trick is to Season and Smoke the Vegetables just like you treat the Meat. The flavors are Amazing, and will keep Guests or Customers coming back for More! Last year while in San Antonio, I learned that some long lost Cousins actually owned a BBQ place called Brown’s Bar-B-Que. So I went to visit with my Mom who, it turns out, tries to eat as Nutritiously as possible- almost to the point of being Vegan. Upon meeting our Kin for the first time, they were very nice as the Restaurant was coming off of a late Lunch Crowd rush. After noting that the only fresh Veggie on their Menu was a Baked Potato, we asked if they had Salads or any Vegan dishes? They said regrettably “No”, but wished they did because there is a nearby community of Joggers and “Healthier Types” who would probably patronize them if they served more Veggies. Vegan BBQ! Smoked Veggie Baked Potato Recipe created for Brown B Que in San Antonio, TX with a little help from BBQ RESCUES! NBBQA “I Am BBQ 2018”- March 14-17th- River Ranch Stockyards Fort Worth, Tx. Successful BBQ people know that strong relationships with others who can help them navigate, problem solve, find solutions and thrive is the pathway to success. It’s also these relationships which help make our BBQ journeys rewarding and worthwhile. In ancient Greece, fruit and vegetables were a significant part of the diet, as the ancient Greeks consumed much less meat than is usual today. Legumes would have been important crops, as their ability to replenish exhausted soil was known at least by the time of Xenophon. As one of the first domesticated crops to be introduced to Greece, lentils are commonly found at archaeological sites in the region from the Upper Paleolithic. The Mediterranean diet they follow has been linked to lower rates of cancer, obesity, Alzheimer’s disease, and—most recently—heart disease. And although we can’t adopt all aspects of the Greek-island lifestyle, we can incorporate some of the eating patterns and dietary traditions practiced there. The best part? Eating like a Greek is not only healthy; it’s also delicious. Enjoy stops to swim or snorkel, stay refreshed with unlimited complimentary drinks, and savor a delicious Greek meal, including barbecue dishes, served by the crew. Choose a morning or sunset cruise when you book. Some of the nutrients that certain superfoods contain include antioxidants, thought to ward off cancer; healthy fats, thought to prevent heart disease; fiber, thought to prevent diabetes and digestive problems; or phytochemicals, the chemicals in plants responsible for deep colors and smells, which can have numerous health benefits. Foods with high vibrational energy and nutrients include organic nuts, fruit, vegetables and fresh herbs. Keep to a minimum foods such as meat, poultry and sugar, and foods that are highly processed, microwaved, chemically altered, genetically altered (GMO), contain chemical additives or have being mistreated by a person. Consider grilling kabobs. To keep your protein portions controlled, alternate one small piece of the total meat serving with three servings of non-starchy vegetables and then repeat. The mixture of the two adds bulk, and the meat and vegetable juices make for a flavorful dish. Global sales of healthy food products, in fact, are estimated to reach $1 trillion by 2017, according to Euromonitor. While the health fads and trends have come and gone (remember oat bran in the 1980s or low-fat everything in the 1990s? ), this time the category appears to have serious stamina. The good news is BBQ food can be healthy and relatively low in calories as well as finger-licking good. Grilling is a geat way to cook meat without additional fat and some of the fat in the meat will sizzle away. Forget the fatty sausages – do something different. Diners who request vegetarians dishes at a restaurant known for smoked slabs of slow-cooked, tenderly marinated pork and beef are sure to get laughed out of the place, right? Customers want healthier options for their kids, Hengst says. “We tempt them with the stuff they like, but we make sure it’s also good for them,” he says. We believe that BBQ doesn’t equal meat and it can be better when there is no cruelty involved. Using traditional techniques, we are able to bring out a flavor that no other vegan places have been able to replicate. My aim was simply to figure out what–as a nutritional, ethical, political and environmental matter–I should eat. Along the way, I’ve collected a few rules of thumb that may be useful in navigating what I call the Omnivore’s Dilemma. My Catering and BBQ Rub companies are on the “first wave” of Healthier Grilling, and the industry is slow to change. We are still one of the few Onsite Caterers in the country that regularly offers Gluten-Free, Vegan and Vegetarian BBQ Menus. Through the BBQ RESCUES Foundation, I hope to influence more caterers and restaurants to offer Healthier Grilling Options to their customers. In Los Angeles, as well as around the U.S. Chef Mick Brown is a Food Blogger/Purveyor based in Los Angeles, with over 30 years BBQ and Grilling experience. Aside from Caterer and Private Grilling Instructor, his passions are creating Easy Grilling Recipes and searching for the World’s Best Flavors as General Manager of Tastee BQ Grilling Co. In May of 2015, he won Grill Master Champion on Food Network’s Cutthroat Kitchen on special BBQ episode “Grill or Be Grilled” (Season 8, Episode 3). He also recently appeared on Bravo TV, catering for the Cast of Vanderpump Rules (Season Finale). He is also author of web blogs The Adventures of Tastee BQ and BBQ Catering Confidential. His latest media project BBQ RESCUES!, includes a Blog Talk Radio Show, Youtube TV Channel and Podcasts on iTunes. The new Non-Profit BBQ RESCUES! Foundation is sponsoring the #BBQProject2020, that does outreach to the Barbecue Community to promote Smarter and Healthier Grilling in the fight against preventable diseases like Childhood Obesity, Diabetes as well as other important Causes. Email- Mick@BBQRESCUES.org. Once upon a time Americans had a culture of food to guide us through the increasingly treacherous landscape of food choices: fat vs. carbs, organic vs. conventional, vegetarian vs. carnivorous. Culture in this case is just a fancy way of saying “your mom.” She taught us what to eat, when to eat it, how much of it to eat, even the order in which to eat it. But Mom’s influence over the dinner menu has proved no match for the $36 billion in food-marketing dollars ($10 billion directed to kids alone) designed to get us to eat more, eat all manner of dubious neofoods, and create entire new eating occasions, such as in the car. Some food culture. I’ve spent the past five years exploring this daunting food landscape, following the industrial food chain from the Happy Meal back to the not-so-happy feedlots in Kansas and cornfields in Iowa where it begins and tracing the organic food chain back to the farms. My aim was simply to figure out what–as a nutritional, ethical, political and environmental matter–I should eat. Along the way, I’ve collected a few rules of thumb that may be useful in navigating what I call the Omnivore’s Dilemma. Don’t eat anything your great-great-great grandmother wouldn’t recognize as food. Imagine how baffled your ancestors would be in a modern supermarket: the epoxy-like tubes of Go-Gurt, the preternaturally fresh Twinkies, the vaguely pharmaceutical Vitamin Water. Those aren’t foods, quite; they’re food products. History suggests you might want to wait a few decades or so before adding such novelties to your diet, the substitution of margarine for butter being the classic case in point. My mother used to predict “they” would eventually discover that butter was better for you. She was right: the trans-fatty margarine is killing us. Eat food, not food products. Avoid foods containing high-fructose corn syrup (HFCS). It’s not just in cereals and soft drinks but also in ketchup and bologna, baked goods, soups and salad dressings. Though HFCS was not part of the human diet until 1975, each of us now consumes more than 40 lbs. a year, some 200 calories a day. Is HFCS any worse for you than sugar? Probably not, but by avoiding it you’ll avoid thousands of empty calories and perhaps even more important, cut out highly processed foods–the ones that contain the most sugar, fat and salt. Besides, what chef uses high-fructose corn syrup? Not one. It’s found only in the pantry of the food scientist, and that’s not who you want cooking your meals. Spend more, eat less. Americans are as addicted to cheap food as we are to cheap oil. We spend only 9.7% of our income on food, a smaller share than any other nation. Is it a coincidence we spend a larger percentage than any other on health care (16%)? All this “cheap food” is making us fat and sick. It’s also bad for the health of the environment. The higher the quality of the food you eat, the more nutritious it is and the less of it you’ll need to feel satisfied. Pay no heed to nutritional science or the health claims on packages. It was science that told us margarine made from trans fats is better for us than butter made from cow’s milk. The more I learn about the science of nutrition, the less certain I am that we’ve learned anything important about food that our ancestors didn’t know. Consider that the healthiest foods in the supermarket–the fresh produce–are the ones that don’t make FDA-approved health claims, which typically festoon the packages of the most highly processed foods. When Whole Grain Lucky Charms show up in the cereal aisle, it’s time to stop paying attention to health claims. Shop at the farmers’ market. You’ll begin to eat foods in season, when they are at the peak of their nutritional value and flavor, and you’ll cook, because you won’t find anything processed or microwavable. You’ll also be supporting farmers in your community, helping defend the countryside from sprawl, saving oil by eating food produced nearby and teaching your children that a carrot is a root, not a machine-lathed orange bullet that comes in a plastic bag. A lot more is going on at the farmers’ market than the exchange of money for food. How you eat is as important as what you eat. Americans are fixated on nutrients, good and bad, while the French and Italians focus on the whole eating experience. The lesson of the “French paradox” is you can eat all kinds of supposedly toxic substances (triple crÃ¨me cheese, foie gras) as long as you follow your culture’s (i.e., mother’s) rules: eat moderate portions, don’t go for seconds or snacks between meals, never eat alone. But perhaps most important, eat with pleasure, because eating with anxiety leads to poor digestion and bingeing. There is no French paradox, really, only an American paradox: a notably unhealthy people obsessed with the idea of eating healthily. So, relax. Eat Food. And savor it. 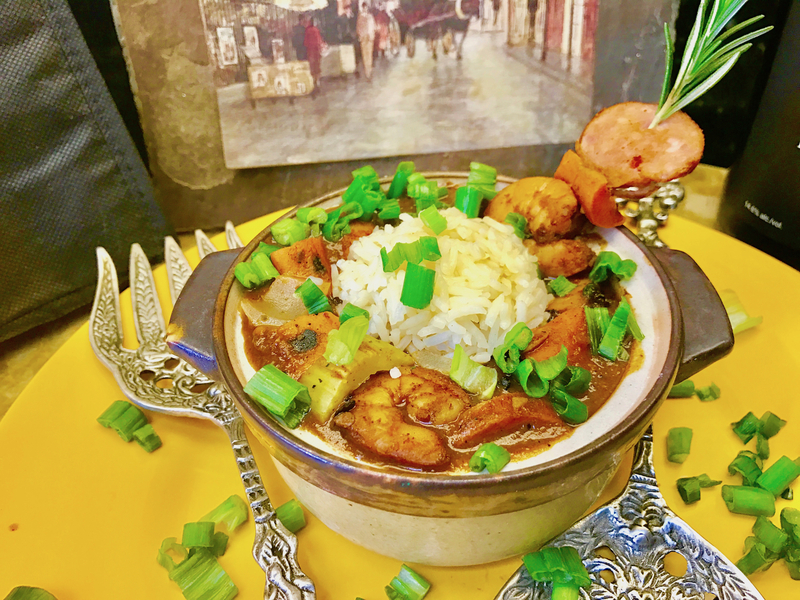 ‘Not So” Fat Tuesday Grilled Gumbo/Jasmine Rice with Grilled Vegetables, Smoked Chicken, Shrimp and Sausage. Being naughty never tasted so Good. Sin. Repent. Repeat. Can you really make a #Grilled #GlutenFree version of #Classic #NewOrleans #Gumbo actually #Healthier and #Tastier than the Original? Even #Vegan/#Vegetarian with “Hot #Grilled #HolyTrinity” (#Celery, #BellPeppers & #Onions) and/or with #Smoked #Shrimp, #Chicken and #Sausage? YouBetcha! Add the sweet flavors of #Applewood and Hickory? Fuggedaboutit! Check out this Robust #Calorie #Shredding #Recipe inspired by the #UrbanPressWinery in #Burbank, CA., using their #PinotNoir as part of the #Recipe. #ChefMickBrown also uses #Kingsford’s new #Applewood #Charcoal, #Hickory #SmokingChips and #HEROIC! Gluten Free #NoSalt/#NoSugar Blend by #CaliforniaGoldBBQRubs. #Vegetarian, #Seafood and Classic Mixed #Meat “Not So” #FatTuesday #Gumbo #Recipes are available on www.BBQRESCUES.com. Part of the #BBQRESCUES #GetFitChallenge where #LowFat, #LowCalorie #Grilling is #Delicious & #Fun! Catering or Hosting a Big Party? It is better to start with a pot of Well-Seasoned, Mild, Vegetarian Gumbo. It can be perfectly delicious served with Diced Grilled Vegetables. Then split into a second pot to add Smoky Grilled Shrimp, Crawfish, Chicken, and/or Andouille (or Mild) Sausage. Another option is add Meats, and Spicy Hot Sauce to individual Servings. Be mindful of any Guests who may want to avoid Shellfish, Pork or Hot Spicy foods. 1. Season, Marinate and Smoke Peppers, Celery, Carrots and Onions for at least an hour. Reserve 1/2 for Puree, Dice 1/2 for soup and cover with 3 Cups Vegetable Broth, simmer slowly. 2. Pan Roast Chopped Garlic, heat with Wine and remaining Veggies. Puree until smooth and combine with 1 Cup Broth to make Smooth. Add to pot with Stewed Tomatoes. Season well with BBQ Seasoning, Browning and Seasoning Liquid, File Powder, Salt, Pepper and Hot Sauce to taste. 3. Reserve Green Onions and Parsley for Garnish.